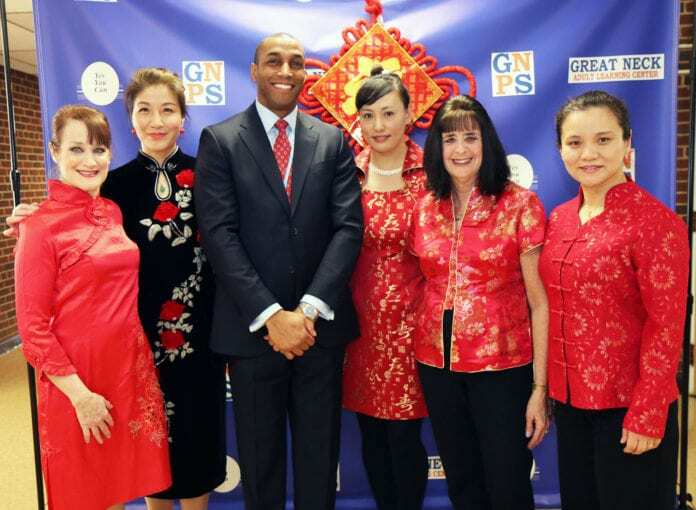 The Great Neck Public Schools Adult Learning Center held their third annual Lunar New Year celebration on Jan. 30. Students and staff shared traditional foods, enjoyed performances, and participated in fun games to celebrate the Year of the Pig. Pictured here are event coordinators Susan Kleinman, high school equivalency teacher, Sophia Han, a student, Errin Hatwood, director of adult education, Gabby Gao, a student, Fran Rosen, a high school equivalency teacher, and Joyce Jing, a student.